The South Shore Line suspended all train service Wednesday due to dangerous cold. The train line announced the cancellations at around 4 a.m. Wednesday, saying a test train "encountered significant overhead wire problems," which indicated that operations would be unsuccessful all day due to the extreme sub-zero temperatures. South Shore officials would continue to evaluate whether or not operations would be possible on Thursday, the rail line said in a statement. Several other area train lines canceled or modified service Wednesday amid the life-threatening deep freeze. 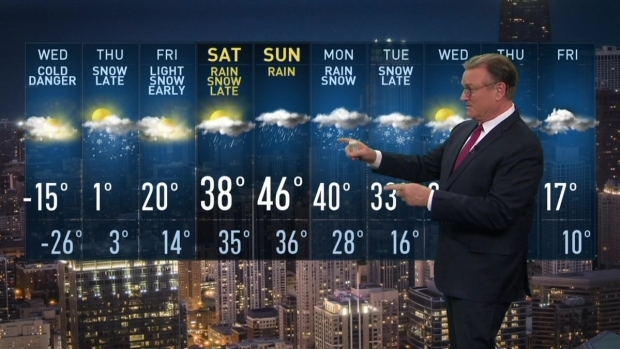 Brant Miller has the latest forecast for the Chicago area. Amtrak trains going to and from Chicago on Wednesday were all canceled, the train service said Tuesday night. That impacts the roughly 55 trains operated from the Chicago hub daily, the agency said in a statement. Metra trains will run a modified schedule Wednesday, urging riders to leave extra time for travel, as temperatures below -10 degrees will reduce all train speeds to 60 mph.